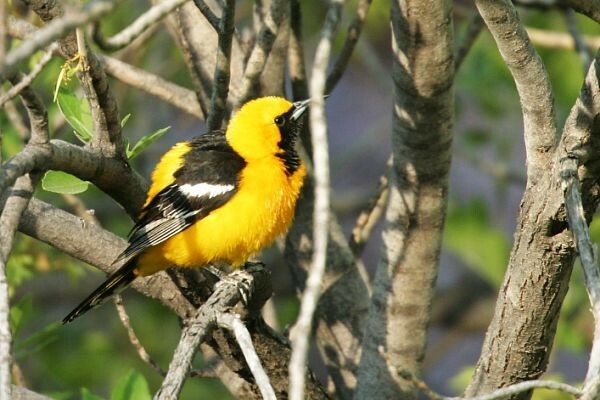 Hooded Oriole male photographed by Robert Shantz at Pennsylvania Canyon east of Duncan, Arizona on May 27, 2003. The knitted grass socks that these birds make for nests can be found year around, but the birds flee the cool weather during the winter months for the warm tropics. Food includes fruit and especially insects. In the Sonoran Desert look for these birds along the few remaining riparian corridors such as the San Pedro and Hassayampa Rivers, Arizona. Cottonwoods and sycamores are favorite trees in which to nest and forage for food. Copyright Michael J. Plagens, page created 13 June 2008.